This image is made from data acquired during Voyager 2's closest approach to Neptune on August 25, 1989. Visible is the backlit planet viewed from Voyager 2 on its way out of the Solar System after the spacecraft had passed closest approach. The crescent shape of Neptune shows bright cirrus clouds and a dark band encircling the South Pole region, as well as a cyclonic structure at the pole itself, perhaps similar in nature to Saturn's now famous hexagon. Encircling the planet is the very faint ring system and the three bright ring arcs in the Adams ring; Liberté, Égalité and Fraternité, which were discovered by Voyager 2 during the fly-by. To my knowledge a comprehensive high resolution image of the entire Neptunian system has never been released. However, image data for both the planet itself as well as the ring system and the largest moon Triton, taken within fairly short intervals from similar vantage points, do exist in NASA image archives. To produce the image I scoured the Voyager 2 image data freely available from NASA's Planetary Data System. I was able to find raw images of a crescent Neptune showing intriguing cloud bands around the South Pole. No complete image of the ring system exist, but based on available long exposure images of portions of the rings I was able to create a model of the density profile. I then fitted this model around the crescent planet to get a complete view, in accordance with the viewing angle as seen in the raw Voyager 2 images. A raw image of the brighter ring arcs was then processed and overlaid on the rings in a position corresponding with the original image data. Visible to the right of Neptune is the small crescent of its largest moon Triton. This part of the image is based on Voyager 2 data that shows Triton here in front of Neptune, but which was not taken until 3 days after the fly-by. I decided to include this data to achieve a more complete picture of the magnificent Neptunian system. 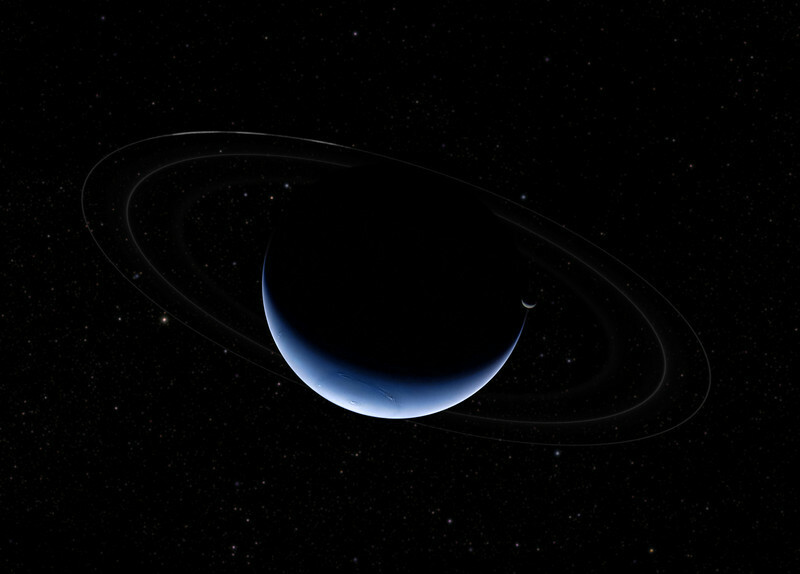 Because the viewing angle of Neptune as seen from the spacecraft did not change significantly while it was receding out towards interstellar space, the entire scene would at this time have appeared very similar to what is depicted here. Only the positions of the clouds and ring arcs would have changed since the closer image of the Neptune crescent was taken. In order to include the background star field I plate solved one of the raw long exposure images of the rings which showed some stars. The successful plate solving revealed that the background was centered around RA 06h 09m 52.213s Dec +67° 31' 20.258" in Camelopardalis. I then downloaded corresponding DSS image data from Google Sky and inserted it as a background, sufficiently toned down so as to not interfere too much with the grandeur of Neptune while still providing a realistic context. The field of view as seen from Voyager 2 is approximately 5.5° x 7.5°.